Our local, insured and experienced engineers solve most problems within one hour. 90% of the problems fixed same day within 2 hours. 8am - 8pm, seven days a week! PC Repairs Today is a family business providing on-site computer repairs to home and small business users in all local areas to include Kent, Surrey and South London for over 10 years. Our team of local engineers support with a range of technical services within your home or office on the same day that you call, usually we arrange an engineer visit within two hours of you call. We don't use confusing jargon, we explain your diagnosis and what needs to be done, offering you the opportunity to watch the process and even pick up a few tips! In most cases, we carry replacement parts for your convenience, we can install replacements parts during the visit, often within only one hour! Our engineers are based locally in these post codes below. 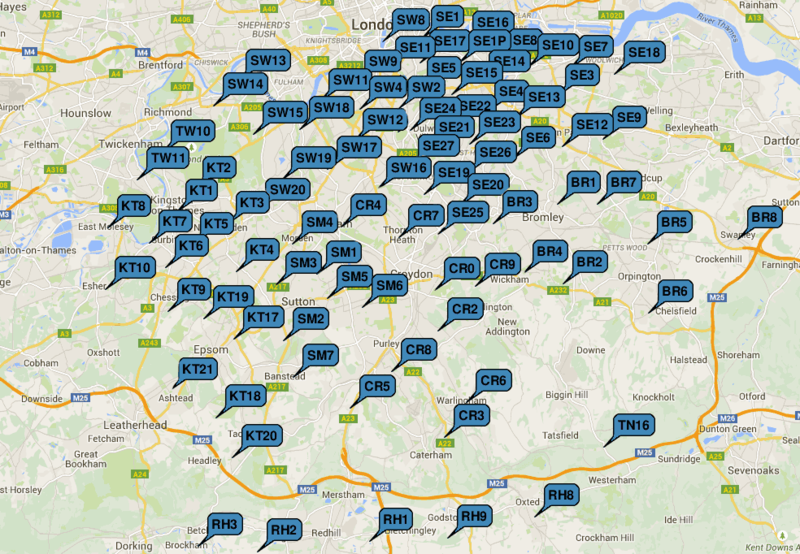 With a large radius covered we can provide a quick, reliable local service. If you are slightly outside the area or unsure if your location is included in the map below, please contact us to find out.